Not Drowning But Waving offers twenty-two feminist essays focusing on the complex relationships between women academics and the liberal arts. Separated into three sections – “Not Drowning/Waving,” “History/Temporality/Generations,” and “Activism” – the anthology gathers together a broad range of topics, including the relationship of liberal arts to academic institutions, the many pressures that women in academia face in their attempts to balance personal life with professional duties and aspirations, the costs and opportunities for women academics who hold administrative positions, and the relation of feminism to the liberal arts. Covering such a breadth of topics, the text nevertheless succeeds remarkably in sustaining a consistent thematic and structural dialogue between the articles. This active dialogue is in part a result of the fact that the anthology emerged out of papers presented at a conference held in 2006 to celebrate the achievements of Patricia Clements—the first woman Dean of Arts at the University of Alberta. In addition to providing a thorough historical context for issues facing women academics and an instructive history of feminism and Women’s Studies in the Canadian academy, this anthology provides a valuable resource for all women working in what can be an insensitive and unwelcoming academic environment. The introduction to the anthology provides a cogent overview of the above issues while effectively integrating references to the specific articles therein. Many of the articles provide important and often sobering statistics about women in academia; of particular note are those statistics that expose the wide gulf between the number of women academics in the ranks versus those who have managed to attain administrative positions or elite positions such as Tier One Canada Research Chairs (CRCs). Cecily Devereux’s “What to Expect When You’re Not Expecting” is one such article, providing and interpreting a raft of statistics that illuminate the long road that women in academia still have to travel in order to achieve equity with their male colleagues. Along the same lines, Louise H. Forsyth’s “Desperately Seeking Equity” specifically addresses the issue of women’s relative exclusion from CRCs, using evidence gathered by eight senior academics who then took their claims—with little effect—to the Canadian Human Rights Committee. The “postsecondary pyramid” (included on p. 215) compares, in stark graphic form, the stunning differential between the men’s successful movement up through the ranks versus the much less successful movement of women, illustrating again the challenges faced by women wishing to advance their career. The graph is a powerful reminder of this inequity, and the anthology might have benefitted from introducing it earlier, in tandem with statistics-oriented articles such as Devereux’s and Forsyth’s. On the topic of the personal challenges faced by women in academia, Donna Palmateer Pennee’s “I Forgot the Attachment” and Susan Brown’s “School/Work, Home/Work” are especially relevant. Pennee’s article is organized around an innovative structure that integrates her spontaneous and imaginative conference presentation with her present reflections on the topic. Her writing is engaging and elegant, and her inclusion of statistics concerning visible minorities provides valuable data not present in some of the other articles. Her reference to the “cult of speed” and the pressure to accomplish more and more as administrations increasingly “download” labour onto professors will resonate with all academics, and is nicely echoed by Aruna Srivastava’s exploration of “the cult of exhaustion” in “On Justice, Exhaustion, Apology and Alienation. In “The Way They Stayed,” Heather Murray presents an historical account of a unique topic: the story of the women alumni and the roles that they could and did play relative to Universities. Murray’s discussion of the practical institution-wide struggles for women to be integrated into the university, and the conflation of women’s educational needs with their residential requirements, provides a seldom discussed historical context for women’s struggles to achieve parity in academia. Several of the articles explore in sophisticated ways the connections and disjunctures between “second” and “third” wave feminism, frequently problematizing how these categories have been conceived and deployed. Tessa Elizabeth Jordan’s and Jo-Ann Wallace’s “Waves, Tangles, and Loops” offers a particularly insightful historicization of second wave feminism in the form of a corrective to assumptions that third wave feminists hold about those who were active in the second wave, doing so in the context of the third wave’s preoccupation with the rhetoric of “high theory” and the manner in which this focus dismisses the language used by the earlier generation of feminists. In “Not a Post-feminism Feminist,” Elizabeth Groeneveld offers an excellent account of the origins of third wave feminism and assumptions about it, while at the same time critiquing the entire notion that feminisms fall neatly into the “wave” metaphor. The number of contributions aiming to correct theoretical and historical blind-spots among “third wave feminists” tends to highlight the relative underrepresentation of the latter throughout. While not a significant drawback, the anthology might have included more articles by younger “third wave” feminists. The inclusion of Erin Wunker, who was a graduate student at the time that she wrote her piece, and Phil Okeke-Ihejirika and Julie Rak, who were hired in the late nineties, is a small corrective to this; however, the anthology would have been further strengthened by including more women who have joined the ranks of academia in the twenty-first century. 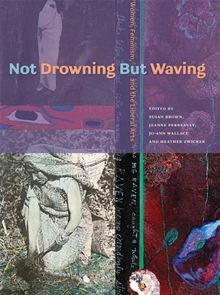 The metaphors of “drowning” and “waving” in title of the anthology provide fertile ground for the analysis and references that abound throughout the anthology to “drowning” and “wave.” However, these metaphors are used to the point where they threaten to become emptied of meaning. Virtually every article makes reference to “drowning” and “wave” in one way or another, and Aritha Van Herk’s “Drowning in Bathtubs,” indulges in the drowning metaphor to the point of exhaustion (although she does identify her “bathtub” metaphor as “something of a hoax”). Groeneveld’s article and Phil Okeke-Ihejirika and Julie Rak’s “Between the Waves” both offer critiques of this metaphor (“Between the Waves” adding a welcome critique of the Western generational model of feminism and suggesting it be replaced with the idea of “feminisms as communities of difference” that attend and listen to one another). Even the critiques of the wave concept, however, emphasize the extent to which this metaphor dominates the book. Given the fact that many of the articles and their writers in the other sections fall under the category of activism, one wonders why there is a relatively short separate section for the subject. The articles in this section could easily have been integrated into the other sections without any compromise to their structural coherence. Christine Bold’s “Who Benefits?,” an analysis of memorials dedicated to “women who have been murdered by men” offers a trenchant analysis, as well as offering a way to mediate between social justice workers and academics. This article would have fit nicely in the second section. The other articles included under “Activism,” while dealing with issues of social justice and material culture that do not expressly fall within academia, nevertheless offer pertinent and cogent analyses and could be similarly integrated. Not Drowning But Waving is written by, and to some extent for, feminists; as such, it is able to provide a nuanced examination of the very complex relation between and within academic feminisms, expanding out to include the relationship between feminists and academic institutions. This does not mean, however, that the anthology has nothing to say to women (and men) who have not necessarily or consistently engaged in academic activist feminism. The articles’ explorations of burnout and extra demands on women—particularly in relation to childcare–would go a long way toward contextualizing the isolation and stress experience by many women, while enjoining women to work together as allies. As someone who feels that her inclusion of feminist perspectives within the classroom has become less than robust, I appreciated Isobel Grundy’s article “Mentoring,” and I would have liked to hear more on the integration of a feminist orientation into the classroom. The anthology might benefit from more institutional breadth; because the conference took place at the University of Alberta, and many of the authors hail from this institution, the personal perspectives from the U of A are somewhat overrepresented. Most of the articles written by women at the University of Alberta do, however, manage to transcend their immediate institutional concerns and one can, with modest effort, extrapolate from these personal experiences to broader contexts. Christine Overall’s “What I learned in Deanland” is most successful on this account, partly because she provides detailed practical advice for any woman aspiring to an administrative position. This anthology is worth reading for all women who feel isolated by academia’s failure to address their personal needs and who feel a sense of failure at not living up to unrealistic workloads and the pressure to advance their careers at any cost. Many of the articles made me consider the fact my department runs as such a well oiled machine has because the difficulties faced by the women academics in the department are never formally addressed. Instead, discussion of these difficulties is consigned to brief hallway exchanges between the women in my department—exchanges dominated by accounts of feeling overextended and overwhelmed. Not Drowning But Waving: Women, Feminism, and the Liberal Arts does much to address the formal silence around challenges facing women academics. In its historicizing and problematizing of women’s place in academia, woven into textual exegesis and accounts of personal experiences, Not Drowning But Waving: Women, Feminism, and the Liberal Arts has much to offer for anyone open to examining and articulating women’s experiences within academia. Dr. Jennifer Burwell received her B.A. from Queen's University at Kingston, and her M.A./PhD from Northwestern University. She joined Ryerson University's Department of English in 1997, and has been involved with the York/Ryerson Graduate Programme in Communication and Culture since its inception. Her research spans a wide range of interests, including: utopian literature and the utopian impulse in contemporary critical theory; gender studies; media and communications; and science and technology in popular culture. Her current book project investigates media representations of 20th and 21st advances in physics, from Hiroshima to quantum and chaos theory.